What do you mean there are rules? Why would you follow the rules? This was so much fun to read. I had this on my TBR for over 18 months and for the life of me I cannot remember why I put this off for so long. A shame I tell you. If I was aware of the hype when I put it on my list, I forgot about it, so I read this without any expectations. I wanted to read more books that have been on my TBR for a long time and this was up next. I enjoyed this, a lot. There were a lot of laugh-out-loud moments for me, one that stood out was movie night. Nimona is a cute impulsive high energy shapeshifter. I just realized why I had put off reading this. I always read werewolf whenever I see the word shapeshifter. Anyway, she’s reckless, dangerous and oh so funny. She shows up and announces to Lord Blackheart that she is his new sidekick. He initially refuses, not wanting a kid hanging around, until she tells him she’s a shapeshifter and can take the form of any living creature. He realizes that she may come in handy and hires her. Lord Ballister Blackheart – Once hero now a notorious villain. He’s such a complex character in that he’s a villain that doesn’t want or need to kill in order to fight the powers that be and expose their hidden secrets. He does bad things but for good reasons. Can a villain have a big heart? Sir Ambrosius Goldenloin – Nemesis to our Blackheart. Stooge of the evil Institution of Law Enforcement and Heroics that rules the Kingdom. They claim to be the good guys but do they really have the Kingdom’s best interests at heart? What dark secrets are they willing to kill for in order to keep them covered? As for as the story, I said I was hooked from page 1 and quickly got the feeling that all wasn’t what it seemed. It starts out as an adventure then it becomes something more complex. The bad guys don’t seem so bad. I started to question motives and what defines a villain. What secrets were the characters hiding? And Nimona’s backstory, amazing. The world they lived in was unique, to me at least, in that it appears to be set in medieval times with Lords, swords, magic, and dragons alongside modern day technology like computers and rayguns. I liked the artwork, I didn’t love it. It took me a few minutes to get used to it and then I got so engrossed in the story that the style seemed to make sense. 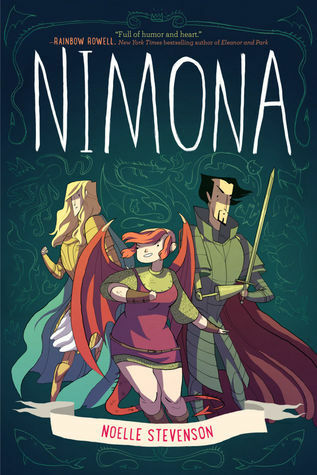 Nimona is an adventurous, often funny, sometimes dark and sad story. This has also been on my TBR forever.. but mainly just because it is so massive haha. I can totally get how seeing the words “shape shifter” would conjure up the whole werewolf image. I am sure it does for many. It’s big but it’s a fun, quick read. I don’t know what it is about werewolves in print. Bitten was one of my favorite shows, but for the life of me I am not attracted to their stories in print. Ooh, B&N. Will there be a book haul post next week? If you end up reading Nimona, I hope you enjoy it as much as I did. This is a great story, that quite a few teens at my library have read. Well, I am sold… great review… I love when the lines around villains and motives become a bit blurry while reading. it just adds another exciting layer, doesn’t it? 😀 😀 Thank you, Liz. I hope you enjoy this.